Do you ever wonder how you will find the time to exercise? So much to do and not enough time in which to do it, as the old adage goes. This feeling may exponentially increase when one becomes a mother. As natural caregivers, women often find themselves tending to everyone else’s needs before their own. Priorities undoubtedly change as children are welcomed into the world, and it’s not uncommon for exercise to make its way down to the bottom of the busy mom’s priority list. The perpetual fatigue that accompanies motherhood and childcare surely doesn’t make it any easier to fit in that daily dose of movement that is critical to preserving health. Lack of time, lack of energy and lack of motivation highlight the top three barriers for those who struggle to maintain an exercise routine. 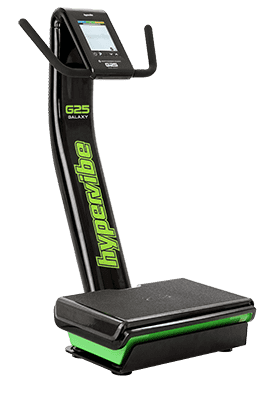 While there are many fitness products on the market, whole-body vibration (WBV) has unique characteristics that facilitate exercise with ease. It has the capability to produce effective results in short periods of time, making it an especially ideal option for busy mothers. After pregnancy, women face many challenges with respect to their physical and emotional health and appearance. The condition of the pelvic floor requires special consideration after childbirth. It is very important to re-train the pelvic floor muscles and tone the abdominal region to optimize function. This is true regardless of whether the birth was vaginal or by cesarean section, as pregnancy and delivery place a great deal of stress on the pelvic floor, spine and abdominal region. In the postpartum period, weakness and pain make it more difficult to strengthen the muscles in these areas. Diastasis recti, a common occurrence in the later stages of pregnancy, involves the separation of the most superficial abdominal muscle called the rectus abdominis. This issue contributes further to abdominal weakness and may require specific treatment by a qualified healthcare provider. Considering that post-delivery exercise with this condition must be approached with great care, it is crucial to identify which approaches cause the least amount of strain. WBV offers the option to initiate a gentle and efficient exercise program without imposing excessive stress on the body. The parameters can be adjusted accordingly to promote comfort and gradual progression as strength and endurance improve. WBV has roots in the space program, scientists discovered it as a way to combat the negative effects of the anti-gravity environment on bone and muscle tissue. Research to study the effects of WBV has since continued worldwide and has produced exciting results. WBV elicits a widespread response throughout the body as it stimulates the contraction of up to 90% of muscle fibers. This means that results can be achieved in a fraction of the time compared to a typical exercise program – good news for everyone and busy moms alike! Changes may include improvements in strength, circulation, pain, balance, weight, mood and even quality of life. Research has been conducted to determine the effects of WBV on pelvic floor dysfunction, including stress urinary incontinence, which involves a loss of urinary control during physical movements or exertion. Results have included increased activation of the pelvic floor muscles and improved strength, as well as reduced symptoms of urinary incontinence. As incontinence is not uncommon after childbirth, it is important to consider all non-pharmacological treatment options. While WBV is not a replacement for prescribed interventions, it can be administered in conjunction with other treatments, including pelvic floor muscle training supervised by an experienced healthcare professional. A home exercise routine incorporating WBV can then be continued to enhance the effects of the pelvic floor training, as well as allow the individual to progress to a comprehensive exercise program. While standing on a WBV platform is the standard position for training, there are other positions that are useful in targeting the abdominals, back muscles and pelvic floor. Sitting on the platform targets the abdominals and muscles around the spine, which can also induce pelvic floor contractions. The user may also perform pelvic re-training exercises as instructed by their healthcare provider simultaneous to the vibration, as active contractions will provide added benefit along with those produced by the vibration stimulus. Another option is to lie down and place the lower legs (calf muscles) on the unit to receive a massaging effect, which promotes drainage of lymphatic fluid. This may be especially helpful in reducing swelling in the legs associated with long periods of sitting or standing. It is also possible to target the upper body for strength training, which is critical for new moms. Carrying a child, managing a car seat, lifting a stroller, and transporting items for childcare are all strenuous activities that require adequate strength and stability of the trunk, legs, and arms in order to avoid injuries. Both the modified push up and plank positions, which involve placing the hands on the platform, aim to strengthen the upper body and core simultaneously. An important benefit of increased strength is better posture. As a result of these changes, individuals may notice improved breathing and digestion which can, in turn, boost energy levels. The impact of WBV on hormones has been investigated in various studies. It is recommended that women exercise regularly after giving birth to promote hormone re-balancing. WBV may assist with this process as a time and cost effective method of exercise. While most of the research to date concerning the effect of WBV on hormonal responses has been conducted with men, preliminary studies with women have shown different responses to those of their male counterparts. Further investigation is needed to clarify the mechanisms behind hormonal changes and the differences in the responses to WBV between the sexes. Overall, WBV offers benefits that are unmatched by other types of exercise. 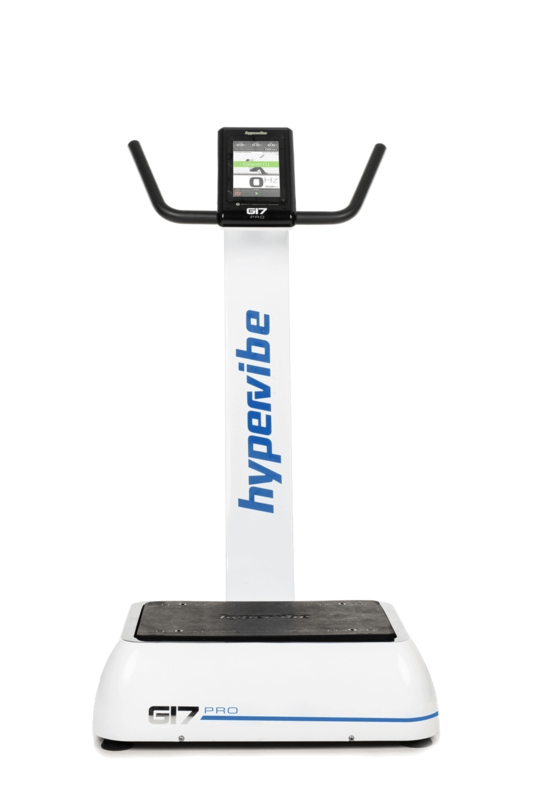 Even if one is able to find time to go to the gym for a long workout, Hypervibe can be used to augment the routine. As the word has spread about the benefits of WBV, more health and fitness professionals, including physical therapists, personal trainers, Pilates instructors, and physicians are incorporating WBV into their practices. While continued research pertaining to the effects of WBV on all aspects of women’s health is needed, WBV has already proven to be a beneficial method for people of all ages with different fitness levels. 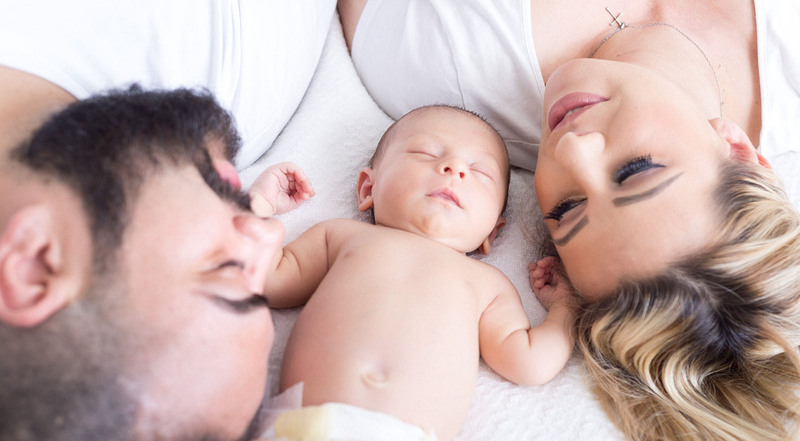 Integrating WBV into a postpartum exercise program can serve as a measure to enhance wellness as women rise to meet the challenges of motherhood. It is important to note that women should not use Hypervibe or any other WBV unit when pregnant, as WBV is contraindicated during pregnancy. After childbirth, whole-body vibration may be an excellent option to allow you to begin a gentle exercise program while being mindful of your needs during the postpartum period and beyond. It is recommended that you speak with your physician(s) before you begin a WBV exercise program to ensure that you are able to participate safely. Please do not hesitate to contact Hypervibe for more information concerning any questions about safety, product designs, and operation. We look forward to serving you as our loyal customer. 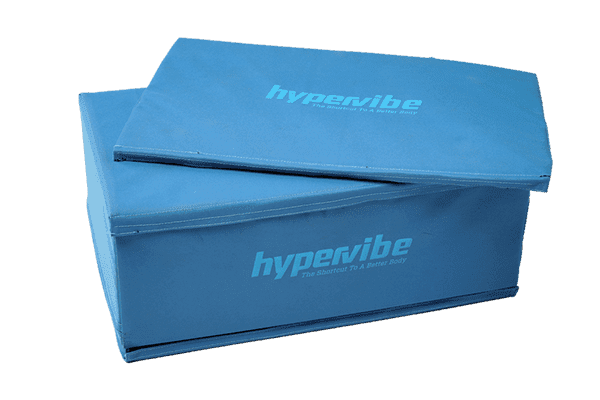 As one of the few pivotal (side-alternating) units on the market that can be purchased at an affordable cost, Hypervibe was designed with quality and efficiency in mind. As the vibrations pass through the body, they will create a relaxing or an invigorating effect, depending on the chosen settings. Hypervibe is highly customizable to individual needs, offering a larger range of frequencies (speeds) and amplitudes (amount of displacement up and down) compared to other units. In addition, Hypervibe offers excellent customer service and the option to connect with a trained expert to allow you to get the most out of your experience. 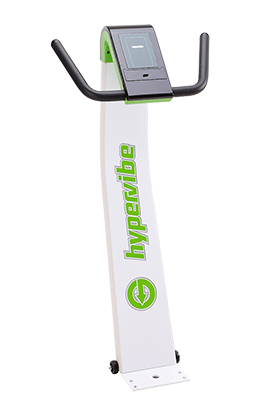 Please do not hesitate to contact us for more information on Hypervibe – your shortcut to a better body! A Comparative Study of Whole Body Vibration Training and Pelvic Floor Muscle Training on Women’s Stress Urinary Incontinence: 3 Month Follow-Up. Journal of Family and Reproductive Health. Farzinmehr et al, 2015. Determining Posture and Vibration Frequency that Maximize Pelvic Floor Muscle Activity During Whole-Body Vibration. Medical Science Monitor. Lee et al, 2016. 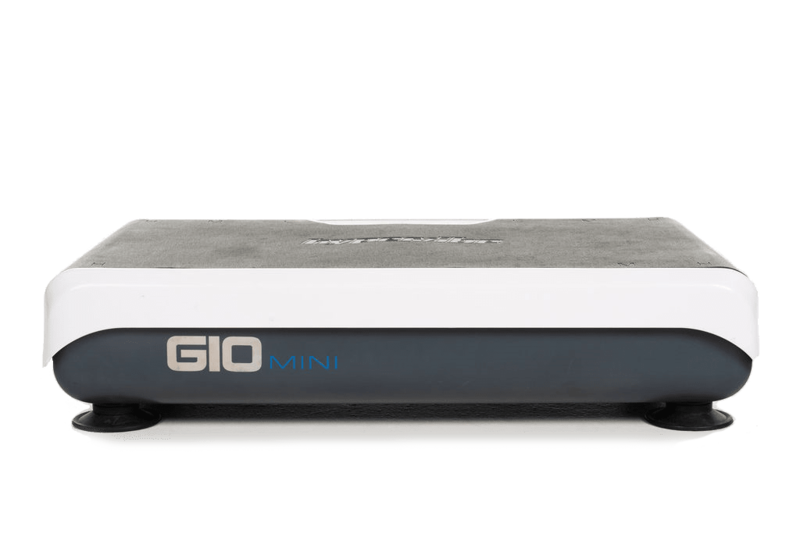 Effect of Muscles on Mechanical Vibrations Produced by the Galileo 2000 in Combination with Physical Therapy in Treating Female Stress Urinary Incontinence. Van Der Heide et al. Hormonal and Metabolic Responses to Whole-Body Vibration in Healthy Adults. The Endocrinologist. Fricke, Oliver, 2009. The Use of Vibration as Physical Exercise and Therapy. Journal of Functional Morphology and Kinesiology. Musumeci, Giuseppe, 2017. Vibration as an Exercise Modality: How it May Work and What Its Potential Might Be. Rittweger, Jorn. European Journal of Applied Physiology. Rittweger, Jorn, 2010. Whole Body Vibration Exercise: Are Vibrations Good for You? British Journal of Sports Medicine. Cardinale, M. & Wakeling, J, 2005.